Providing a forum to share knowledge, create a networking relationship among interested parties, and provide technical programs that are meaningful. This bypasses the Acceptance of Terms and Conditions and is intended for Viewing the Registered Booths only. This is the 2019 Expo Poster. Please feel free to copy and paste into your Customer Communications. 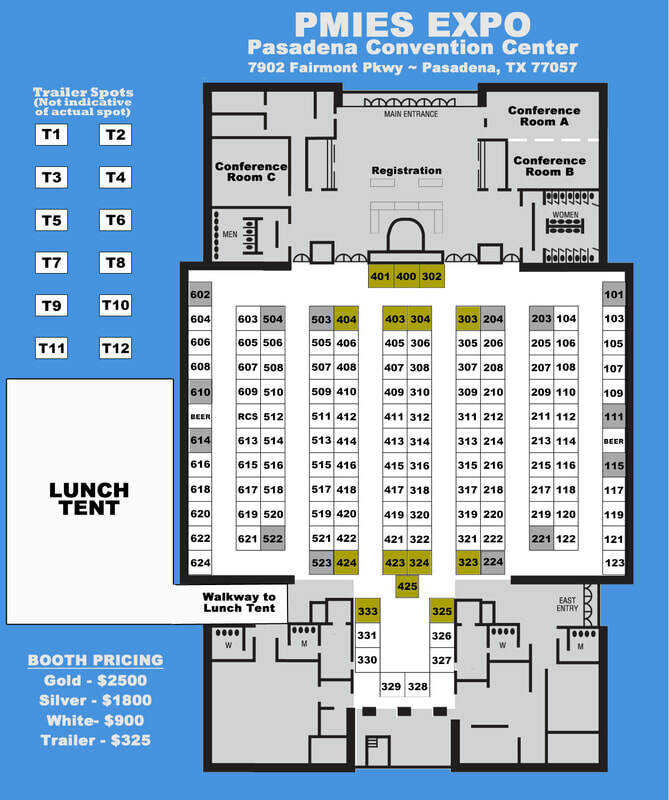 Once you have reserved your Booth Space, you may want to change or add to the furnishings in your Booth beyond what PMIES provides... If so, click the Green button below to access the PMIES's Expo & Conference's Decorator - Phoenix Design Group page for help on additional Booth furnishings or changes. Below this is the list of Companies who are exhibitors in the 2019 Expo. 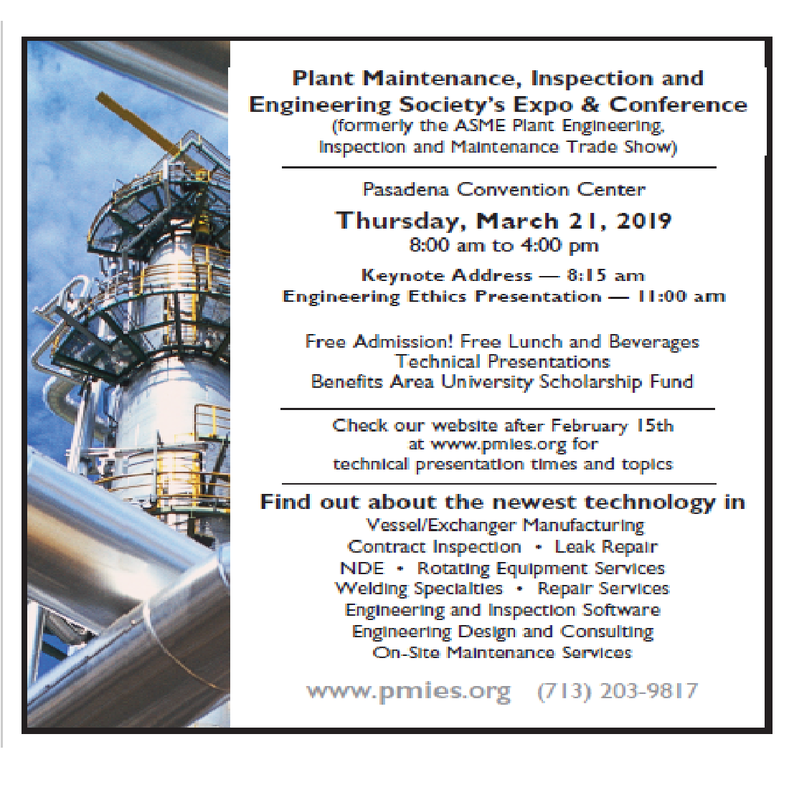 425 Advanced Rupture Disk Technology, Inc.
332 ALS Maverick Testing Laboratories, Inc.
107 Axis Mechanical Group, Inc.
305, 307 Complete Corrosion Solutions Inc.
211, 213 Equalizer International, AMERICAS, Inc.
412 Freeport Welding & Fabrication, Inc.
306 Gulf Coast Engineered Solutions, Inc.
330 Iris Inspection Services, Inc.
505 Kobelco Compressors America, Inc.
513 Marco Specialty Steel, Inc.
114 Master Tech Services. Inc.
609 Metaltech Service Center, Inc.
522, 621 Olympus America Inc.
617 Piping Technology & Products Inc.
622 R.B. Mosher Company Inc.
424 Sentinel Integrity Solutions, Inc.
206, 208 USA Industries, Inc.
323, TR3 Versa Integrity Group Inc.